_This site is home to the Azieran Mythos; the dark fantasy writings of Christopher Heath illustrated by V. Shane. We are hoping to release many books over the years to come, including occasional anthologies. If you are a writer or reader of dark fantasy/sword and sorcery/heroic fantasy, you may find this website of interest. Also, please join our facebook page for updates on upcoming releases, including anthologies. Azieran Adventures Presents Artifacts and Relics: Extreme Sorcery is an anthology of fantasy stories which revolve around powerful, and in some cases, world changing magic items. 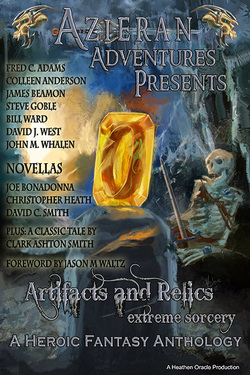 The tales are masterfully written by veteran storytellers such as David C. Smith of "Oron" and "The Sorcerer's Shadow" fame, Bill Ward (Black Gate Magazine contributor), and many other new pulp writers. In the exciting conclusion to The Bloodshed Trilogy, Baron Von Draukenhaus and company follow a map in search of a rumored, mysterious treasure of great power that could help Moongoth in its war effort. The map leads them to the Vault of Ages, where they discover that retrieving the treasure is far more difficult and dangerous than they could have ever imagined. Deadline to submit is over, list of authors who will appear in the anthology is posted on the Heathen Oracle facebook page. Cover sketch for Book III of the Bloodshed Trilogy: "Bloodshed at the Vault of Ages"
Even at the initial stages, I can tell this cover will be quite exciting. V. Shane fans will not be disappointed! Click sketch for larger image. _Click here to see our promotional video for the upcoming Azieran Adventures anthology, "Artifacts and Relics: Extreme Sorcery". Includes a sneak peak of the unfinished cover by V. Shane. Click thumbnails to view larger image. Click on price below to go to order page. Azieran Brom of the Horde: The Hollow Kings / Instant Carnage and the Secret of Runic Steel. Click here to order for .99 cents. The Hollow Kings: The barbarian Brom returns from civilized lands to become the new clan-king, but to keep that title he must prove himself worthy of his kinsmen. Instant Carnage and the Secret of Runic Steel: Something is killing Brom's kinsmen and it is whispered to be the demon bear Barshakk, displeased with Brom's reign. Brom decides to confront the mystery himself, and unravel the truth behind the murders. What he learns will haunt him forever. The Hollow Kings and Instant Carnage and the Secret of Runic Steel begin the Brom of the Horde Chronicles. Total length approximately 10,000 words. _ Returning from his mission in The Cinderlands, Von Draukenhaus finds himself in Moongoth with no definite plans. Soon he is persuaded by the morbidean elf, Delorian Dekx, to join an adventuring company in search of a lost vault rumored to contain many valuable treasures—among them an item that could help him recover the Everbeating Heart. However, the map they have obtained has attracted many interested parties, among them an assassin's guild, the local government, and a strange and mysterious cult. The appearance of an old enemy complicates matters further. As confrontations escalate and tensions rise, Draukenhaus realizes that for all the bloodshed in Moongoth, his troubles are only just beginning. Click here to order on Kindle for $2.99. David West, of "Heroes of the Fallen" fame has recently posted his review of "Azieran: Against the Drimlith" authored by yours truly. Check out the link to his blog to read all about it. Thanks! Baron Von Draukenhaus has been summoned from a century long, self-imposed exile to lead a company of expendable heroes in striking a tactical blow against an enemy hellbent on enslaving all of Azieran. Wielding Darkannis, the blade upon which a horned, demonic bat is crucified, Draukenhaus finds himself accompanied by a motley band of strangers: Mizzerotte the volatile mage, St. Cerillian Skiles the pious saint, Diabolique the seductive trap master, Groan the steadfast giant, Delorian Dekx the deceptive harlequin, and a mysterious figure cloaked in black known only as The Archer. During their travels, they must overcome personal differences and complete their individual secret agendas while building the trust and friendship needed to succeed in the world's most desperate gambit. Azieran: Coveting Bloodshed is the first book of The Bloodshed Trilogy, detailing the exploits of Baron Von Draukenhaus as he rediscovers a world he once chose to abandon. Sir Vaiden Erro is a knight of the Malkan Order, sorcerers sworn to uphold the ever-expanding mandates of the Calantian bureaucracy. Originally assigned to guard an ambassador in a foreign land, it is through a twist of fate that Vaiden finds himself charged to help a colleague, Alix, track down and destroy the headquarters of the Drimlith Cabal—those responsible for the recent assassination of a prominent politician. customs and the people are wrought of extreme cruelty. Indeed, as much can be expected by a nation which reveres Bakkal, God of the Undead, above all others. Against this backdrop the two knights (escorted by a small troop of Bludland soldiers) travel across the land, through strange cities and even stranger circumstances. Vaiden is haunted by word that one of his own, a defected Malkan Knight and old acquaintance, has taken up the Drimlith’s cause. To further agitate matters, rumors spread that Bakkal has been slain, provoking social and religious unrest. Meanwhile the Drimlith discover they are being sought and retaliate with their own ruthless countermeasures. The journey culminates in an all-out bloodbath, where not only do Vaiden and Alix stab into the heart of the cabal, but they discover a guarded secret tied to Azieran’s mysterious past. Against the Drimlith is the first novel set in the richly detailed Azieran fantasy world, filled with innumerable dangers, political consequences, and magical intrigue. It is a grim world where civilization is on the wane, savage wastelands meet crumbling keeps, and men of virtue are a rarity. Within this context, dark fantasy takes on new meaning, epic in scope and elegant in design.